Make sure you get asbestos roof removal in Northridge CA from a true expert like AQHI Inc.
At AQHI Inc., we have expert workers that have been fully trained on all the industry best practices for Asbestos roof removal in Northridge CA. Before beginning work, we seal off all openings like air ducts, vents, louvers, drains, skylights, etc. to ensure that no contamination will enter the building. Then we begin working on small sections of roof using a wet removal method to limit the release of hazardous asbestos fibers as much as possible. When we’re done with the roof removal, the work site will be clean, safe, and ready for your roofing contractor to begin work. When you work with AQHI Inc. for your asbestos roof removal in Northridge CA, waste disposal costs will be included in our bid. We bag all asbestos-containing materials as we work, collect them in a safe location, and cover them with a tarp and appropriate signage until we can transport them to an official hazmat disposal facility. The best way to figure out if you have asbestos in your roof is to get the suspicious materials tested. If any materials test positive for asbestos, you will need professional asbestos roof removal in Northridge CA. 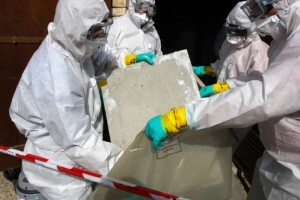 You cannot afford to use anyone but the pros for removal service when asbestos is involved. Only a professional contractor can get the job done right and protect you from liability for environmental contamination. Our asbestos removal office for Asbestos Roof Removal in Northridge CA is open Monday through Friday between 8:00 AM and 5:00 PM and closed for lunch from noon to 1:00 PM. With advance notice, projects can be scheduled for weekends, early mornings and evenings.